Innovative 6-point cradle works with an array of Hoyer slings including 2 4 and 6-point slings * Extended reach for floor pick-up capabilities * Adjustable legs * 400 lb. 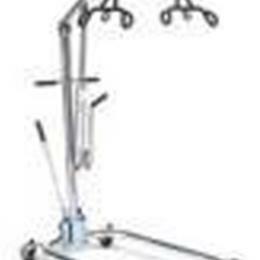 resident capacity * Long-wearing chrome finish maintains appearance * Mast and base separate for easy travel or storage * Standard 4 casters are offset for greater stability and smooth operation * Width 24 in. - 39.5 in * Length 41 * Lift Range of Boom 37 in. - 82.5 in * Base Clearance 5.5 in * Shipping weight 95 lbs.